Most people just assume that they are going to put asphalt shingles on their roof because that it is the most common and cheapest product with long lasting durability. At Peak Roofing, asphalt shingles are our focus because they are the most common and we have the most experience with installation, but what if you decide that you would prefer a metal roof here are some interesting facts we think you should know about. 1. Most people think that metal must be heavier than asphalt. In fact, metal is a lot lighter. 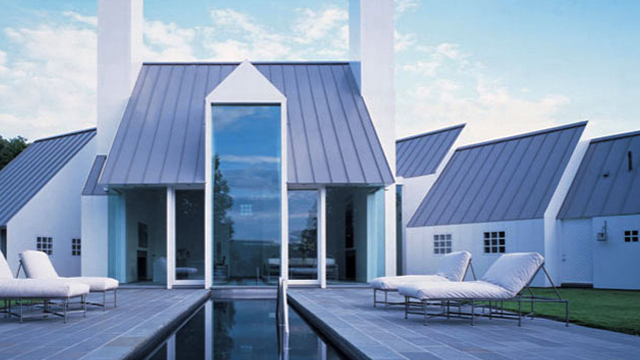 Average metal roofs weigh 1.4 pounds per square foot. In comparison to your average asphalt roof which weighs between 2-5 pounds per square foot depending on the type of shingle used. One of the advantages of metal roofs is that they can be installed over existing roof material (asphalt or shake). 2. There is a difference in lifespan, metal roofs will outlive asphalt roofs by a factor of four, or more. Many people believe that because roofers prefer to install asphalt shingles that this means they are more reliable and last longer; but if you think about this from a logical perspective you will realize that metal has a longer life than asphalt simply based on the materials they are made from. 3. Most metal roofing contractors will try to impress upon their clients the vast array of selection in shapes, styles, and colors available in metal roofing. This is not a particularly amazing claim since the same can be said for shingles. Both products come in a wide variety of styles and colors. 4. Metal roofs are longer lasting. As we have stated in previous blogs the extra cost is justifiable in some circumstance, but we encourage you to make sure that the extra cost is worth it. If you plan on living in your house for less than 20 years, then a metal roof will not increase the value of your house enough to warrant that kind of investment. Remember, if a roof costs you 2.5 times more to put on right now (which is what metal roofing jobs tend to cost) then you had better plan on living in your home for a long time to reap the rewards of that initial investment.